On 2nd November 2018, we were invited to meet with NTUC Foodfare CEO Mr Perry Ong to share his perspective to the ongoing allegations regarding social enterprise-run hawker centres and we subsequently reported on the session on 12th November 2018. Following the publishing of the article, the team had noticed that the quote in our headline, although verbatim, had an unintended meaning when read out of context. We revised our headline due to this and the article was republished later that day. Subsequently, NTUC Foodfare reached out to us regarding the misinterpretation of a quote by Mr Ong, and the article was then taken down intentionally as we sought to clarify their claim of inaccuracy. We have since gained clarity on the matter and the original article with highlighted edits is reproduced below. On August 28, renowned local food critic and consultant KF Seetoh published a post on Makansutra, accusing these SEHCs of profiteering at the expense of hawkers and customers. Seetoh’s post flagged some concerns about the way these SEHCs are run, highlighting poor management practices as well as high rentals and auxiliary costs. I recently had the chance to sit down with NTUC Foodfare’s CEO Perry Ong to hear his side of the story — just how true are all these allegations? 1. SEHCs are supposed to be not-for-profit, so why are you profiteering off these hawkers? Ong: People think that social enterprise is like a charity and that you should not profit. It’s not true. Social enterprise is not about maximising profits, but it doesn’t mean that we don’t make a profit. Ultimately, we need to make sure that the enterprise business is sustainable. But the profit that we actually make, we plough it all back into our social purpose and all the initiatives that we run. For example, to offer food at low prices like the NTUC breakfast set ($1.80 for members, and $2.20 for public). Our cup of coffee or tea also go for as low as $0.60. All these things require funding, and we use the profits earned to benefit the community through our social initiatives. We want to maximise social impact, not profits. We actually have various initiatives to help hawkers support their needs. When we first started Pasir Ris Central Hawker Centre, we started a hawkerpreneurship programme. This is to encourage new crop of hawkers, or hawkerpreneurs who want to start their own business, but don’t have the know-how or have limited resources. With this programme, we actually provide them financial assistance to reduce the capital investment for new hawkers. For example, instead of a two-month deposit, they only have to place a one-month deposit to be provided with the stall fittings and kitchen equipment. We also provide guidance to them because a lot of them are not very familiar on how to run a business. For instance, we give them advice on menu planning, stall design, and display to help attract more customers. Sometimes, there’s a duplication of food types in hawker centres, which means that they are cannibalising each other. So for the new hawker centres we manage, we make sure that we curate the food types so there’s no duplication. This also allows patrons to have more variety to choose from. Everybody serves a unique food type so hawkers can have a better chance of success (lesser competition). That’s our way of helping the hawkers when they come into the centres we manage. 2. Basic rental fee is $2,000, but when additional charges and miscellaneous fees are included, the hawker effectively pays close to $4,000 a month in rental and fees. Ong: In terms of prices, there’s this misconception that the price has gone up because social enterprises are taking [a cut], therefore hawkers are taken for a ride and put in a difficult position. Actually, none of this happens. Let’s start with the rent. Amongst the NEA-operated 100+ hawker centres, there is already a bell curve. If you take away the outliers — people who pay $5,000 to $10,000, and those who rent at hawker centres with low demand — the range is about $1,600 to $2,200. So under the SEHC model, the rent is set within this range where most hawkers are comfortable with, and we even do away with bidding because we don’t want to drive up the rents. Once you do that, hawkers will be under pressure to [increase] their prices. It is the ‘Q’ that I want — share with us your food concept, quality of the food, prices, and operating hours. These are some examples [in terms of] Q for quality. So we tell the hawkers upfront what we want, and if they are comfortable [with it], then they can apply for the stalls. Let’s move on to the ancillary charges. Under the SEHC model, Foodfare does not take anything extra from the hawkers. The ancillary charges are completely flow-through. For cleaning contracts, we require cleaning companies to achieve a Clean Mark — that is the national standard, whereby companies need to make sure they pay a certain wage to their cleaners and send them for necessary up-skilling, amongst a list of other criteria. It is all part of the national effort under the Progressive Wage Model (PWM) to try and lift this industry, especially since the cleaning industry is the one that has a lot of cheap labour. So if the cleaning company wants $x, then the hawkers pay $x. Foodfare does not impose additional layers of cost. Then there’s also marketing costs. Take the instance of Pasir Ris Central Hawker Centre. It’s still quite new and the footfall is a bit weak so hawkers are finding it a little bit more difficult. Even though they have agreed upfront — in fact, they were very happy when they got selected — but when they realise that they don’t have enough business, it goes back to the cost. But of course, for us, we will try to help. We run a lot of promotions such as free parking during weekday lunch hours, organise events such as family workshops and flea markets, programming with the grassroots organisations and partners to drive traffic to the centre. For the other centres which are doing well, we are also doing similar activities. But in terms of the scale, it’s not as much as Pasir Ris because they need more help. 3. Beyond the high cost of operation and management fees, hawkers are expected to offer at least one dish at below $3 in the menu. Ultimately, our whole idea is to provide affordable food to the public. In order for us to do that, we have to work very closely with our tenants and hawkers to moderate the food prices. While we actually moderate food prices, in the case of the social enterprise hawker centres, we have one budget meal to ensure there are sufficient affordable meal options to suit different budgets. Every stall has to offer one budget meal under $3; but for the rest of the items on the menu, they can actually set their own price. We do not limit them at all. To help with the price moderation, we conduct price surveys within the vicinity of the hawker centre. We share that information with the hawkers so they know what prices operators in the vicinity are selling at for similar food types. This is really helpful for the hawkers because they may not know, and they don’t have the resources to go and check. [With this information], they are not pricing off the market and are able to make sure their prices are competitive. In other words, they are able to sell their dishes — other than that one budget meal — at a price that is actually pegged to the market rate. They just have to sell one item cheaply so the poor and needy can [afford it]. It’s not unreasonable, because they are free to determine their prices for the remaining menu items. For example, you price your basic prawn noodles at $2.80. But if you want to to price your big prawn noodles at $5, or add ribs to your prawn noodles for $6, it’s okay. By all means! Because there are also residents who have the disposable income and are willing to pay for better-quality food. Not everyone is poor. Whether it’s the right trade-off, I’m not sure. But it’s important for the public to understand this trade-off. 4. Hawker centres are now run like food court. Hawkers are expected to open 8 to 12 hours a day, and they must apply for leave at least a week in advance. Ong: We don’t run 24-hour hawker centres, so we go for 8 hours, for both Pasir Ris and Kampong Admiralty. The rationale behind this is really about vibrancy. We want to be able to provide enough variety options for the patrons who come to the hawker centres during the three different meal times. 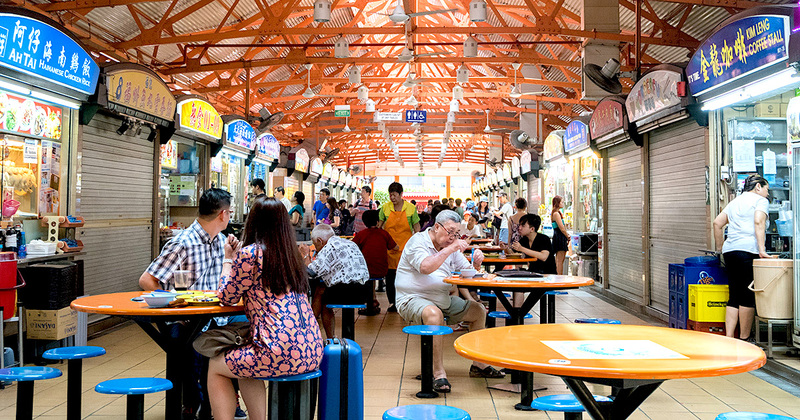 If you look at some of the olden hawker centres in the past, certain centres are very vibrant in the daytime. But after lunch hours, it becomes very quiet. You cannot get any food or only one or two stalls are operating, which is why we implemented a minimum of eight hours of operation. For Old Airport Road, the hawkers are already used to their own operating hours so we left them be. But what we did is, if there are empty stalls and new hawkers are coming in, then we will tell them that in the interest of vibrancy, [they will have to stay open]. As the old one leaves and stalls become vacant, the new ones will come in. It will take a very long time [to fully implement this across all hawkers], but at least we start it. 5. Tenant has to pay $2,000 a month for early termination until the contract period expires. Ong: Hawkers sign a three-year lease, but if they give a one-month notice, they can [leave]. We don’t hold on to the hawkers and make them be committed to the whole three-year lease. If they don’t fulfil it, it doesn’t mean that we’ll go after them. It doesn’t matter if you’re a young, old, new or established hawker, if the location doesn’t suit you, you are free to leave. Just give us a one-month notice. There will always be groups of hawkers who are happy, and less happy. [For the latter group], we will engage them and find out their source of discontentment. But my hypothesis is that they are discontent because they are comparing two different areas: 1) their business is not doing as well as other hawkers so they find the going tough 2) they compare with other hawker centres that are non-social enterprise. Here’s the thing: there’s nothing stopping these hawkers to operate in the NEA hawker centres. There are constantly vacant stalls so the privilege of choice is there, bearing in mind that we do not impose penalty for uncompleted tenure. This saga has prompted concerned hawkers and citizens to call out the relevant authorities, and urge them to make the necessary changes to the existing policies in place. Senior Minister of State for the Environment and Water Resources Amy Khor heard these calls loud and clear, and announced last month that NEA will do a “stock take” of the SEHC operating model. Following this review, NEA announced on Friday (November 9) that it will be making some new changes, with effect from 1 January 2019. These adjustments involve key areas such as operating hours, termination clauses, liquidated damages, and legal fees. Stallholders at SEHCs may now operate five days a week. However, stallholders can still choose to operate beyond eight hours a day, or more than five days in a week, as long as they have sufficient manpower. They can also terminate their tenancy contracts, as long as they give their operators sufficient notice of not more than two months. If sufficient notice has been served by the hawker, the operator cannot forfeit the security deposit. The security deposit held by the operator would also be no more than two months’ rent. In the case of damages and other charges, minor breaches should not cost more than $50, and major breaches should be capped at $100. Hawkers at SEHCs will also no longer have to pay legal fees, as the costs will be borne by the operators. Other business and administrative costs must also be kept “reasonable for hawkers”. According to NEA, these changes will provide a standard “playbook” that the SEHCs need to abide by, and give NEA more oversight into how these hawker centres are run. “I think that even as there are teething issues, there are good outcomes that had been achieved to this model and what we want to do really is to refine, improve, evolve the model. We must then make adjustments, recalibration as and when it is required,” said Dr Khor in a media briefing.